I wasn’t really planning on posting about this. But last weekend, when about four crisis were swirling around me, threatening to make my head implode, I did something rash: I took an unplanned trip out of town. Yes, I know. What a concept. I didn’t freak out for weeks searching train or plane tickets, or researching hotels or restaurants. I just called up Romain, we got in the car, and split. We made it about an hour outside of town and then settled in for the weekend, warming up the house with a raging fire and stocking the refrigerator with my new love, Vinho Verde, a light Portuguese wine that invites leisurely weekend drinking. But sprawled out on the sofa with a stack of magazines, looking out the back door, I noticed an apple tree with quite a few apples swaying from the craggly limbs. Really, I wasn’t planning on doing anything but attacking the last three months of New Yorkers that had been idling in my apartment, but I just couldn’t stand it anymore, so I dragged out a ladder and went out to pick them. Even after I made a giant batch of compote de pommes out in the country, when I got back to Paris, I realized I had three jumbo cases of apples still remaining (which I am storing on my roof) and needed to make something that uses up a lot of them, so I decided to make Apple Jelly. I don’t have a jelly bag or a holder, and went to two stores, including the world’s most famous pastry supply shop, MORA, and the giant department store, the BHV, and of course, neither had them in stock. I was going to go on a rant, but the salesgirl at BHV was perhaps the nicest person I’ve met in that store in my many years of trying to navigate the craziness of that place (she even showed me where the escalator was, which finding it is no small feat in there), and I bought a length of étamine (gauze) from her, and fashioned my own ‘jelly bag’ by lining a colander with it, suspending it over a stockpot to filter and collect the pectin-rich juices. 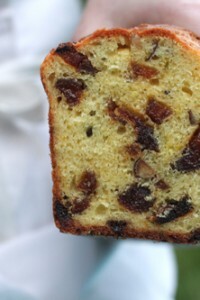 As mentioned, I wasn’t planning to write about this, but one thing led to another, and when I smeared a crust of grainy bread with Bordier salted butter and piled a slippery spoonful of the warm jelly onto the bread, and took a bite, it was one of the few times in my life that something I put in my mouth made me stop whatever I was doing or thinking about, and I just stood there, enjoying the mingling of the bread, the salty butter, and the sweet fruity jelly. It was so worth almost getting bonked on the head by an apple for. The guidelines I used were from the National Center for Food Preservation, and said to cook the apple jelly to 220ºF (104ºC), which will be the setting point, but I ended up cooking mine further. So it’s best to test your jelly by dropping a dab on a chilled plate, putting it in the freezer for a few minutes, then checking to see if the mixture has jelled by nudging it with your finger and seeing if it mounds and wrinkles. If you don’t have a candy thermometer, you can use this method to test your jelly.One pound (450 g) of apples cooked will yield about 1 cup (250 ml) strained juice from the cooked apples. So if you have less apples, or you get a different yield (since all apples are different), you can use that as a guideline and add 3/4 cup (150 g) sugar and 1 1/2 teaspoons of lemon juice per cup of strained apple juice. 1. Rinse the apples and cut them coarsely into chunks, then put them and the cores and seeds, into a very large stockpot. 2. Add the water, cover, and bring to a boil. When bubbling, reduce the heat a bit, leave the lid askew, and cook for 20 to 30 minutes, until the apples are tender and cooked through. 4. Let stand overnight (or at least three hours), and no matter how tempting, do not press down at any time on the apples to extract more juice or the jelly will get cloudy. 5. The next day, measure out the juice. (See Note below about the apples.) You should have 8 cups (2l). Pour it into a stockpot fitted with a candy thermometer, add the sugar and lemon juice, and bring to a boil. During cooking, if any white scum rises to the surface, skim it off. 6. Cook until the temperature reaches 220ºF (104ºC). At that point, turn off the heat and begin testing the jelly on a chilled plate in the freezer, using the method mentioned in the headnote. When it wrinkles and holds its shape, it’s done. If not, continue to cook and re-test it at intervals. This batch set at 230ºF (110ºC). 7. Remove from heat, stir in the liquor, and ladle into clean jars, then cap tightly. Storage: I don’t preserve my jelly or jams in heat-treated jars because I eat them quickly, but store mine in the refrigerator where they’ll keep for several months. If you wish to preserve them, you can find instructions for canning at the University of Georgia website. Note: The cooked apples can be passed through a food mill and used as applesauce, or for Chewy Oatmeal Raisin Cookies, Nonfat Gingersnaps, or my favorite Granola recipe. The description of crusty bread, salted butter and warm apple jelly sounds amazingly delicious right now. Ahhh, what I wouldn’t give to have that for today’s breakfast. Thanks for sharing the recipe and story – glad you were able to make it out of town to relax for the weekend. Yummy! I have a boatload of free Gravensteins, some of which I made into apple sauce. I was going to do a butter, but I think I will try this with the balance. The color is lovely too. Maureen: I love Gravensteins. Lucky you! You could probably make apple butter with the apple cast-offs left over after they’re drained. Just be sure to toss some unripe apples in the mix for the pectin. Apple jelly. What a nice idea. I have never tried to make this but I have a great source of apples in Berlin with the Apfelgalerie so I might give it a whirl. 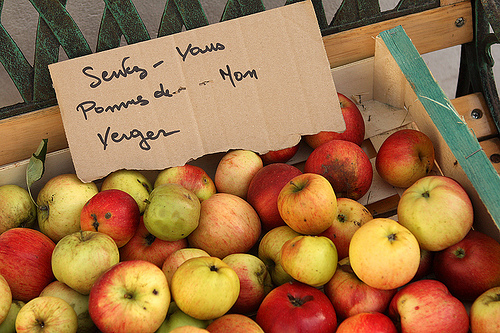 I keep reading about Gravenstein apples but haven’t been able to figure out what they would be called in Europe? You said twice that you had no intention to publish this, but I’m glad you did, those simple moments are wonderful and cheerful. I love that you share those, and the way you make this narration. Sounds like a fabulous project! I am a big apple jelly fan. Hope to be making this soon!! Beautiful photography and writing as always. I love when you go realized that was recipe was indeed blog-worthy! Hope I do this justice. Hello David! I follow your blog from Portugal and today I was so happy because your post talks about 2 things I love: apple jelly and Vinho Verde! Your recipe of apple jelly makes me think of my grandmother, her apple jelly was so delicious. And even today every year me and my mother we make apple and quince jelly. We make also “pâte de coings” (with the “pulp” of the quince) and quince jelly (with the seeds and skins): on utilise tout, c’est trés écologique ! it’s a early november tradition in our house, and in a lot of portuguese families. Et le Vinho Verde c’est fantastique (en été avec des fuits de mer …. ), comme la région du Minho où il est produit, avec des cépages natives. Si un jour vous venez au Portugal je serais revis de vous donner quelques contacts dans la région, les proprietés où le Vinho Verde est produit sont fantastiques! Je vous envoi le link du site de l’organisme qui represent les interêts des producteurs de Vinho Verde: http://www.vinhoverde.pt/en/default.asp. I love your work David! My family went apple picking in the north Georgia mountains over the weekend. 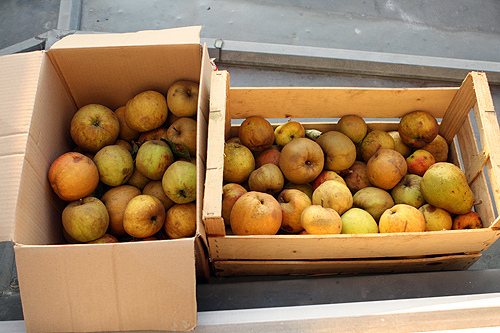 I read that the best way to store apples is to wrap each one in newspaper and then box them up in a cool spot. Ask me in a few weeks or a month if it works! If it doesn’t… apple jelly time! We also love to make apple butter- a bit of brown sugar, some cinnamon, allspice and cloves…. What a nice weekend. I love picking and preserving. Apple jelly is a but sweet for me so I usually make a spiced one with quinces ornamental or larger. Easily foraged here in Dublin. Make it a bit tarter and it us good with meat or cheese or in a glaze for pork or stirred into a sauce instead of redcurrant jelly. I usually don’t peel the apples but sometimes only put the quince peel and cores in the jelly pot cut up the flesh cook seperately and suspend in the jelly . being Irish I just clean the jars sterilise seal and keep on the shelf. Make some chutney with your apples! interesting… almost the end of apple season here in Connecticut – but I may be able to squeeze this in. @Foodie in Berlin: Gravenstein apples are called “Gravensteiner” in Germany and Switzerland, where they’re very popular…..
My sister regularly makes jellies from sloes, wild damsons, brambles and crab apples while I often make soft cheese or strained yoghort and if we need something to do the straining in we go to Mothercare here in the UK and buy three-ply muslin nappy liners which work perfectly. Well I, for one, am super glad you did post. I’ve never done a spontaneous trip like that, but I’d like to think that one day I’ll as cool as you and will do so :) Especially if it ends with jars of apple jelly that remind me of my grandma. Thanks, David! Pretty as a picture to paint.. This jelly looks great! As a jelly novice, when you say “Pour it into a stockpot fitted with a candy thermometer”, is this something I could buy already fitted or do I have to rig it this way? And if I have to rig it, how does one do that? Thanks! I made jelly this weekend too – but they weren’t free apples. As you suggested, I ran the “leftover” pulp through a food mill, put all of it in the crockpot with some brown sugar, cinnamon, and nutmeg and after cooking it most of the afternoon wound up with apple butter. 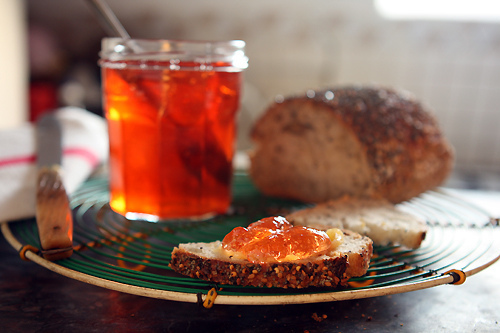 Thanks for getting me back into jelly/jam making – there’s nothing better than home made jam. I would love to have a bite, too! The jelly looks great in you Bon Maman glasses. I have many of them waiting to be filled. Thanks for sharing the recipe. Maya: Candy thermometers have clips, which allow them to be attached to a pot. (I use a thermometer like this.) You can buy them at hardware stores and in most supermarkets if you live in the states, as well as online. They’re pretty inexpensive and I recommend people buy two because invariably you might drop one–as I did once when I needed it and didn’t have a back up. btw: I’m not fond of those digital probe thermometers that some might ask about, since the probe often reads the temperature of the bottom of the point, where the point rests, and doesn’t give an accurate reading of the jelly, unless you keep the probe suspended. It just occurred to me that this would be a great use for all the seeded grapes I’ve been getting from the CSA! Do you have any tips particular to grape jelly? Should I put some apple in there for good measure? I’ve never made my own apple jelly, (I will now, thank you!) but I always keep a jar in the fridge. Aside from using it on toast, it makes, hands down, the best glaze base for just about anything from savory to sweet dishes. 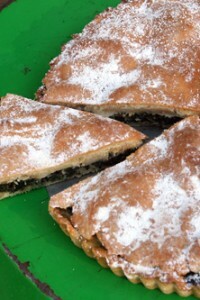 I prefer it on most glazed fruit tarts over apricot that seems to be used for most glazes. It also makes a nice sweetened thickener in some instances. 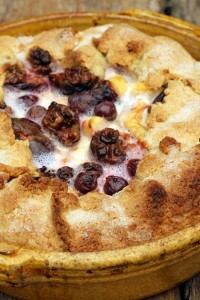 Susan: When I poach fruit, I often reduce the syrup and use that as a glaze or a sweetener. It lasts quite a while. In fact, I’ve had a jar of it in my refrigerator that’s been there for about a year, that I dip into every once in a while. Hi David, I just happen to have some beautiful pink-fleshed apples sitting on my patio waiting for me that would make a fantastic jelly. Thanks for the inspiration.. They are tangy yet sweet and turn a lovely pink color when cooked. I don’t know what kind they are. The next time you make jelly and need a bag ,(our handyman suggested this) try using a nylon (unused ) stocking.It sounds kind of funny but it probably works very well. . I love the burnished, almost pink color of this jelly. I’m normally not much of a jelly person – I make Concord grape jam instead of jelly, and I love my apple butter with a fierce passion – but that is just too pretty. Thank you for sharing! I was thinking along these same lines to use up some of this fruit we’ve got here. Thanks for the inspiration, David! I like the sound of the jelly …and I love how good it looks. Also that we can used the leftovers too! Yay!! Too good to be true. Do you think it would work well as in an apricot glaze too? What beautiful jelly! I was just thinking about my favorite jars being Bonne Maman and how they were perfect for jam. Oh, Duh! They did have jam in them, being jam jars and all. I haven’t had apple jelly in years! When my grandmother passed away, we were told to choose some keepsakes. Everyone else headed for the jewelry box and I headed for the pantry. She had terrible taste in jewelry, but her preserves were amazing! I chose a couple of jars of apple jelly, as well as a few jars made of crabapples and my favorite, mayhaw, and a bottle of her wine. I have a collection of Bonne Maman jars, too, and you’ve inspired me to see if I can make apple jelly myself! Thanks, David!! I am so excited to try this- you have totally inspired me to go apple picking this weekend. I’m doing a trial run today, if all goes well, I hope to include this in my Christmas goodie bags :) Thank you! So timely! I’m about to get a load of apples from my parents’ fuji tree when they come up to visit this weekend. Can’t wait to try this. I put on five pound just reading your wonderul description. I really miss salted butter in Italy! Looks amazing David. I love jam and jelly making. I am very fortunate to have a fig tree in my back yard and love to make fig jam in the late summer with lots of vanilla and spices. It always takes me back to memories I had of my great grandmother, who would make a wonderful crabapple jelly. I bet this would make a great glaze for tarts as well, which I think several have already mentioned. Your remaining apples would make a nice sauce to go over roasted pork, just add some cardamom, raisins, or other dried fruit, maybe some allspice, shallots, and a little Rosemary on the pork. Yummy! Beautiful apple jelly, David. And I see that your great collection of jars came in handy. Ever since I read about your jar collection, I have been more careful to save jars, especially the pretty ones and the ones that are the right size for marmalade. David, I love making preserves and jellies. My mom taught me to can a looong time ago and I think it is a great skill to have, especially if I want to win a reality show about living in the 1800s. :) Thank you for the great post and recipe. I have only had apple butter, not jelly, so I look forward to trying this. 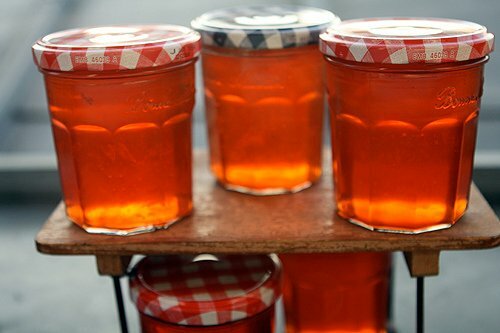 I’m perpetually out of pectin, so Apple Jelly is one of my favorites – it has TONS of natural pectin! I’m also a big fan of cognac, but never though to add it to my jelly. I’ll certainly try this recipe out soon though! Thanks for sharing! Love your comment about Vinho Verde. We can get Portugese Vinho Verde here too. It’s inexpensive and refreshing! Good for you with the free apples and your jaunt out of the city. For a minute there, I could swear that I smelled the jelly apples cooking. It was so real. Then, I remembered the apples on my stove that I had started for applesauce! Am definitely going to try making jelly with more of our big CSA supply of mixed apples. We’re huge Vinho Verde fans too! Drank it literally all summer long. Loving the heavier red stuff now, but man that got us through some HOT days. What a fun, accidental adventure! And too funny (but not…. believe me) that even on holiday the lure of a kitchen project is irresistible. Hooray for the getaway — and the souvenir! Last year my husband made apple jelly, then made a batch of apple-lavender jelly. The lavender blossoms added a wonderful floral/herbal taste and a rosy hue. The jelly was irresistible! I loved this post, and the WTF post I would never have found if you hadn’t of posted this, like you threatened. I knew apple peel had pectin, but until this week i had no idea that under-ripe fruit had more pectin. I just recently read of someone making blackberry jam and using 4 cups of blackberries and 1 cup of pink (unripe) black berries, because they have more pectin. I’m always amazed at the information I learn from these interesting and entertaining websites! The WTF post had me laughing so hard, that i put it in my favorites for a quick peek for one of these days when I need a good laugh. Thanks David, you never fail to keep my interest. Lovely and hope all is well!! I love how it’s orange and clear like honey. I’ve never had apple jelly and had somehow imagined it to be more opaque and yellowish a bit like applesauce. Nice surprise. I went to Washington DC last week to see the museums, but one of the highlights was a huge farmer’s market full of varieties of apples I had never found before. Virginia has marvelous apples, and the countryside is filled with orchards. It turned out I was there at the right time. Love it David. So cozy and comforting.This weekend being Thanksgiving here in Canada I made uthe usual pumpkin pie but I also made a recipe for Drunken Apple Tarte from Leite’s Cullinaria (http://leitesculinaria.com/?s=drunken+apple). Seemed fitting ’cause we had some heavy drinking Germans visiting us. I bet Calvados would be good instead of the rum. Also made an almond apple tarte from Rose Gray and Ruth Rogers Easy Italian using almond meal. Good food for reading food mags and just blobbing. Yum, thanks! I’m glad you shared. I am totally making this this weekend! And I love the idea of using the applesauce for something else, I hate throwing away things like that! Merci! David, I follow your blog from Charleston, SC, and had to comment on your affection for vinho verde. I recently discovered it to be an absolutely perfect match for one of our favorite local traditional foods, shrimp and grits (the shrimp is fresh and local, pan-sauteed with butter, onion and bacon, and served over creamy white grits; every local restaurant has its variation, perhaps a soupcon of garlic, a trace of shrimp stock, a bit of brown gravy…). Should your travels ever bring you to the “Lowcountry” of South Carolina, please do let this avid reader treat you. And thanks for the apple jelly lesson! If you’re ever in need of a blog topic, I know I’d love to learn more about how you photograph food so beautifully. You have New Yorkers idling in your apartment? How can I get to be one? Che delizia questa gelatina, baci ! You are so right about unripe apples! I also think the uglier the apples the better the preserves are! (from my experience). It’s my first comment on your always inspiring blog, but I simply must say I thought I was the only person getting lost at BHV! I don’t live in Paris, but I go there quite often and I went twice or maybe three times to the underground part of BHV looking for something (I didn’t find by the way) and every time I had to ask where the lift was!!! As for the jelly, I use gauze too (plied in two). I simply go to the pharmacy (also in France) and ask for the biggest and cheapest gauze sheets they have (I explain why just in case they have something they want to throw away with a “servez-vous” note ;-) and I strain the juice just like you did. Oh and I also buy there alcohol to make home liqueurs. They are never surprised. I get inundated with apples this time of year from a tree in the backyard, even despite the squirrels and their penchant to pull a fruit, take one bite and pitch the rest on the ground. I have no idea what type of apples they are but they are definitely cooking apples so I’ve about had my fill of apple crisps (even though my favorite does have some adult beverages included to spice it up!) and apple pies. Not sure why I’ve never thought of apple jelly instead of giving away as many as I can but now I’m inspired.My holiday gifts to friends and family are always baskets filled with homemade foods, candles and liqueur; this year I think they’ll be seeing some apple jelly! I don’t use sugar in my kitchen for health reason and I was wondering if you think using agave or honey instead of sugar will work. I understand that pectin is the allows jellification for hte most part, but sugar helps for sure. Please let me know what do you think. Saule: I’ve not made jams and preserves with liquid sweeteners so can’t advise. I would image you’d have to add pectin, as you mentioned, and perhaps you can find a recipe online or in a jam-making book that specializes in preserves with honey. Sissi: I know! And BHV has 2 sets of escalators so it’s kind of hard not to find them, but I still have trouble. Last year they remodeled the basement and aside from taking out the fabulous café that looked like a toolshed, they put up some maps. Of course, there’s only one or two of them somewhere down there. But as usual, I just walk around in a circle for an hour until I find what I’m looking for. Alison: Yes, use those apples! The apple jelly looks wonderful! I am definitely going to try this-now if I only had some of that divine French butter to go with it. We are on the same wavelength….I made jam a few days ago and had it with sel de mer butter on Poilane bread. Very comforting. I’ve never made apple jelly and like how yours came about. Now you’ll have sunshine all winter! I’ve been making jelly and sauce this autumn with both apples and crabapples. I threw some chopped jalapenos into the cooking juice which resulted in a wonderfully smokey flavor with a bit of a kick. Very nice with brie! I love apple jelly! This is an especially beautiful batch. And vinho verde? The tops! Do you add the Calvados/brandy when you cook the apple juice with the sugar and lemon juice? I’m planning to do the first step of this tonight. Can’t wait! Ellen: The liqueur gets added in step #7. Thanks, David. Sorry I didn’t catch that! The apples are cooking right now. What a fabulous smell! Where can I get jelly jars like the ones above??? @Victoria Murphy: Correct me if I’m wrong, David, but those look to me like re-used Bonne Maman jam jars. You can see in the topmost picture a peek of the “Bonne” on the glass. David said he doesn’t preserve his jelly, so they needn’t be new lids. That said, I’m sure you can find similarly-shaped jars somewhere on the internets… the Seattle-based Specialty Bottle Company (www.specialtybottle.com) sells a few types, though the closest are probably the large hex jars. Just got through making a batch of Apple Jelly infused with rosemary–a favorite of mine. The jars look like jewels in the late of the day, the sun streaming through the sides like facets on a gem. Good to eat, great to look at. Eva: That’s what they are. I swipe them from my in-laws, who have a sizable stash of them! I recently went apple picking so I had a lot of apples and was already running out of ideas. I made the jelly last night and it came out great, nice an clear with a beautiful color. I was surprised how long it took to get to 220F and than to gel at 227F. Now all I need is a crusty bread and some great butter. I love apples and quite everything you can make out of them. You know that you are really convincing when you tell people that something is delicious, don’t you? “It was so worth almost getting bonked on the head by an apple for.” >Bookmarked and hopefully tried out soon enough! i’ve always wanted to make an apricot butter like jelly. have you? i wouldn’t know where to begin. i just love that 1st picture. After reading this recipe and noticing the amount of apples that had gone untouched in our fruit bowl I decided to improve my jelly making skills. I brought some more from the local farmers market which were quite a pale green-y yellow, I can’t remember the variety unfortunately. The jelly came out even better than I had hoped, the calvados gave it an amazing flavour and the lemon kept it from being too sweet. We served it with scones yesterday and it was incredible. Thank you so much for sharing this. 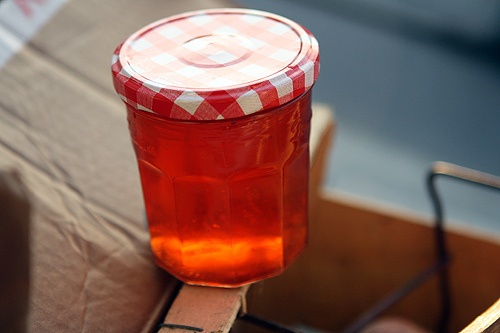 I made this jelly tonight with local Jonagold apples – it is the most beautiful color, I can’t wait to try it!! Thanks for this wonderful and inspiring post! This turned out so well I’m making a second batch! I reduced the strained juice a bit more than the recipe, then boiled it down even more after adding the sugar. And threw in a cup of local (Hudson Valley) cider, and used Apple Schnapps for the liquor. The end result is a gorgeous amber color with a double-apple whammy. Fab.